Even though getting your tax refund can feel like hitting a mini lottery, it’s important to remember that this payment is your money. As a result, the last thing you want is to let it flow out of your bank account just as quickly as it arrives. If you’ve had that experience in the past, the good news is you can do things differently this year. To help you make the most of every dollar that you receive, here are 4 actionable tips for using your tax refund this year. People from all walks of life struggle with managing debt. What often starts off as a small amount can spiral into a snowball that just keeps rolling in the wrong direction. What makes debt so problematic is that you’re not just dealing with the initial amount. Instead, interest is what really gets people in bad situations. Because debt can choke someone’s personal finances, using your tax refund to pay off some or all of your debt is an amazing choice. If you’re trying to decide the specific debt to pay towards, the one with the highest interest rate is almost always the best choice. Whether you have been able to stay out of debt or used previous tax refunds to pay it off, anyone who doesn’t have this burden can intelligently use their refund in a number of ways. A great option is to build up your personal or family emergency fund. Having a meaningful amount of money that’s easily accessible but off limits except for an emergency can give you a lot of peace of mind. Let’s say you’re already debt-free and have a comfortable emergency fund built up. One option to consider for your refund is improving your home. As long as you do your research and choose a project with a strong ROI, you’ll be adding to the long-term value of what is likely your largest asset. The other really good option that’s available for leveraging your tax refund is investing the money. Just keep in mind that even though highly speculative investments like cryptocurrency can seem enticing, they come with an incredible amount of downside risk. Investing your money in a more conservative option and letting it grow for the foreseeable future will likely yield the best return. 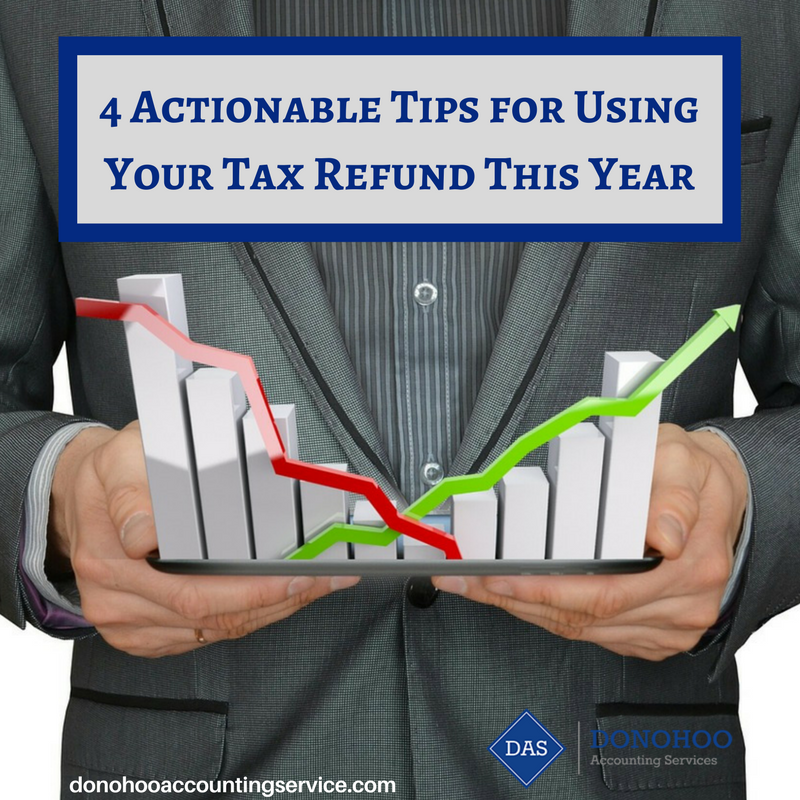 If you want to get your tax return filed so that you can get your refund and put it to good use, Donohoo Accounting Services can take of this process for you. All you need to do is call us at (513) 528-3982 to set up an appointment.